On a brisk Monday evening, members of Milwaukee Jewish Voice for Peace, joined by our allies from Students for Justice in Palestine, the Antiwar Committee of Milwaukee, YES! 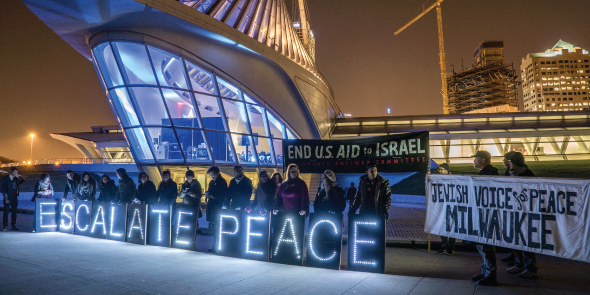 (Youth Empowered in the Struggle) and the Overpass Light Brigade, stood outside the Milwaukee Art Museum, where the annual Wisconsin AIPAC gala event was being held. We were there to greet AIPAC with a message: in consistently advocating war and security over peace they do not speak for us. Outside, our signs projected a luminous hope: ESCALATE PEACE. Inside, a grim confabulation of the Jewish star with the stars and stripes was projected onto one of the walls of the museum. Working for peace, we also protest and mourn the recent violence in Israel/Palestine, particularly, lately, in East Jerusalem. Jewish Voice for Peace opposes the collective punishment of Palestinians. We see this as a result of the ways that the mass media dehumanizes Palestinians. Further, we see the current violence in Israel/Palestine as the outgrowth of 67 years of dispossession and state violence. Only by addressing this history will we find true peace. Having representatives from YES! – an organization advocating for immigrant and undocumented student rights – resonated deeply. Throughout Jewish history, Jews have often been “strangers,” with all the loss of full rights that entails. Ironically, when Jews found a national homeland in 1948, Palestinians became refugees on their own lands. Currently, Israeli security technology companies are doing research and development at the U.S.-Mexico border. Jewish Voice for Peace supports the right of return of Palestinians and all refugees. We also support full equality for all residents of the United States and of Israel. And we recognize that the current refugee crisis in the Mediterranean is the legacy of U.S.-backed military conflict in the Middle East. AIPAC, with its insistence on United States support for Israeli militarism, adds to the violence in the region. We oppose U.S. aid to Israel, most of which goes directly to military and security forces. These directly contribute to violence in the occupied territories. Increasing militarism in Israeli society relates directly to incidences of violence and hate crimes against Arab, African, progressive and LGBT Israelis. With the help of the Overpass Light Brigade, we call for the escalation of peace, not violence and division. We stand with Palestinians and Israelis against the violent status quo, and with Palestinians fighting for their freedom. We seek justice, equality, and freedom for Israelis and Palestinians, and for all people.